18th century restored cabin in a quiet setting. Surrounded by 150 acres. Beautiful scenery and sunsets. We enjoyed our stay in Janis' cabin. It is lovingly restored and furnished. We didn't want for anything. Best of all the first thing we heard when we got out of the car on arrival was "SILENCE!" This was our 2nd visit and will be back again later in the year. The cabin, property, accommodations and amenities are all spot on. We had an amazing time here, and could not recommend this place enough, to unwind and unplug! I was really impressed with how well furnished and equipped the cabin was and how nicely it was built. There is a beautiful view of the mountains just in front of the cabin. Many great mountains (Mt Pleasant, Priest, Cold Mtn) and streams for fishing are very nearby (~10 min driving). We got ~ 4 inches of snow the day before I arrived, creating a nice white landscape for the 5 days I was there. I had a small SUV and it was fine getting up to the cabin with the snow and Janice had cleared a path for me. The cabin was nicely secluded (pretty far and not visible from neighbors), which I liked. Having the owners reasonably nearby provided the needed security and safety even if telephone or mobile phone reception was not available directly inside the cabin (I could get reception by driving up rt 60 in either direction for ~ 5-10 min), which I also liked. Janice was really helpful throughout my stay, on how to find the cabin, checking in with me when I reached the cabin, and was really nice about letting my mom check in with her once when I could not be reached at the cabin so that my family had no doubts about my safety. I thoroughly enjoyed my stay at this cabin and hope that I will be able to stay here again in the future. Beautiful stay for our 41st anniversary. Weather was unusual for New Years eve as last year it was single digits. 50 to 60 degrees out made for great hiking and walking weather. We strolled around the grounds here at the cabin and went hiking to Crabtree Falls which had more water than normal due to the rain. The cabin owners contacted us during our stay just checking on us to see if we needed anything. We highly recommend that you choose this rental for a great getaway in Central Virginia. Thanks Janis and Sam for allowing us to stay in your home. Enjoy a peaceful, secluded getaway at the foot of the Blue Ridge Mountains . 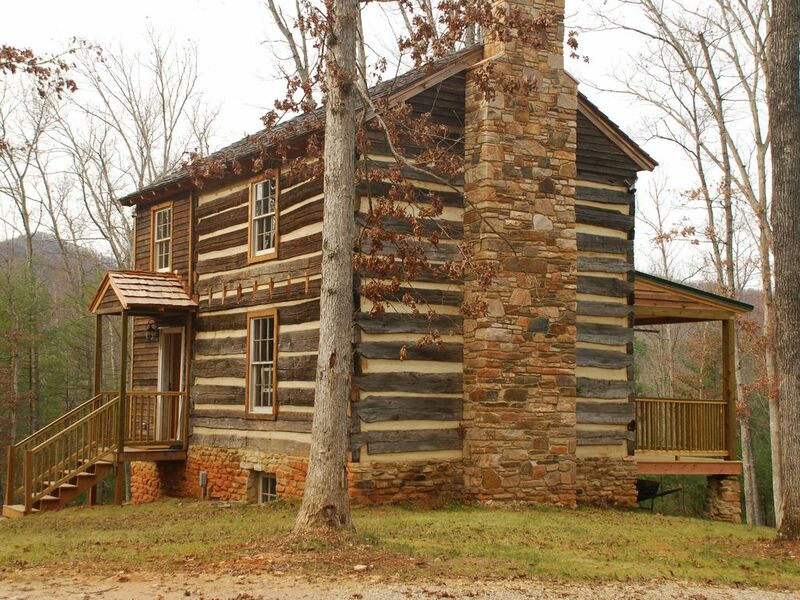 The 18th century restored log cabin sits on 150 acres and is perfect for bird watching, hiking, and relaxing. Beautiful sunsets from the front porch. Restaurants and shopping within 20 miles. Fishing streams nearby. About 20 miles from historic Lexington, 20 miles from Lynchburg and 60 miles from Charlottesville.